If you've read the last post you'll know that Maria has caught the bug ... I so loved watching her enjoying herself, getting a taste of the thrill of catching a wave. Today was a gem. In one of Ricardo Semler's books (7 day weekend) he makes a comment something like, "Its OK to do emails on Sunday as long as you go to the beach on Monday". Well, with the forecast for rain on the weekend, we decided to go surfing on Friday. One of the things we like about yurting is intentionally simplifying life. 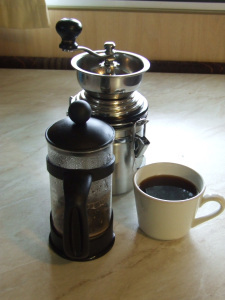 For example, one of my daily rituals is grinding the coffee by hand. 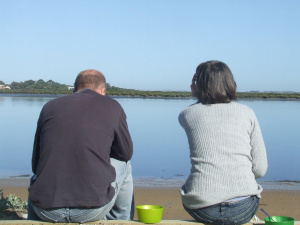 Then, we get to take our breakfast and sit by the river looking over to Barwon Heads. The off shore breeze and medium swell made for perfect conditions today ... we certainly weren't the only ones not in the office today!!! Zac, Maria and I sat outside in the sun while Johanna made pancakes for lunch ... then back to the beach. The plan was pizza for dinner once we got home, but the minute we pulled up the torrential rain came; our little pizza shop is a few minutes walk out our back gate, rain made even that walk impossible, so Maria spun her usual magic with pasta and we then collapsed here on the couch. Weary and satisfied, a great way to feel.